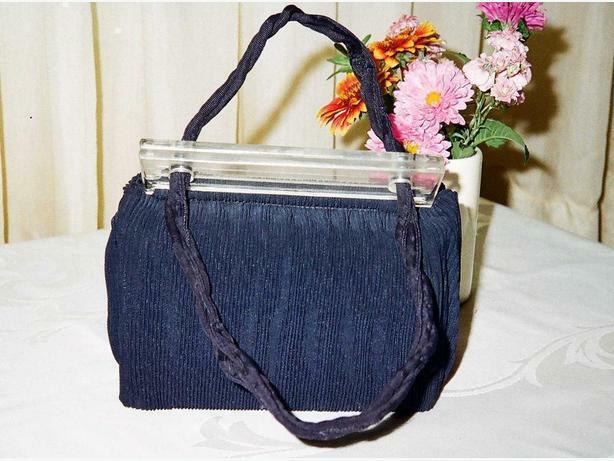 THIS NAVY COLOR CRINCKLE FABRIC PURSE DATES FROM THE 1950'S OR 1960'S. IT CONTAINS ONE LARGE COMPARTMENT WITH A SIDE POCKET. THERE ARE CLEAR PLASTIC CLOSING PANELS ON THE TOP. IT IS IN VERY GOOD CONDITION. FOR OTHER ITEMS OF INTEREST, VINTAGE COLLECTABLES AND ANTIQUES PLEASE VISIT MY OTHER ADS.